Inexpensively manipulates loads up to 5 ton and spans up to 45 ft. While push/pull type cranes available up to 5 tons, they are generally not recommended for capacities over 2 tons. They are not recommended where floors are slick or where floors are covered with debris as it is important for the operator to have good footing at all times when using these cranes. 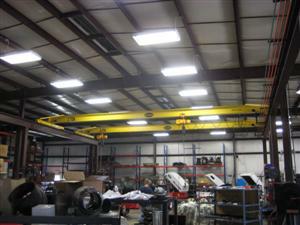 Push/pull overhead traveling cranes become harder to use as the physical size of the product increases. Since these top running bridge cranes are pushed/pulled by the operator they control the speed. This allows the operator to adjust to changing production demands. Top running cranes in general offer the advantage of raising the elevation of the hoist to a higher point than underhung cranes. 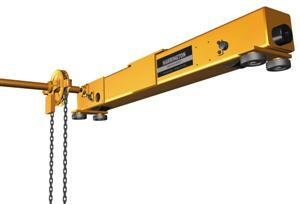 This gives excellent hook height allowing the crane to lift equipment and products higher. Can manipulate loads up to 15 ton in capacity. 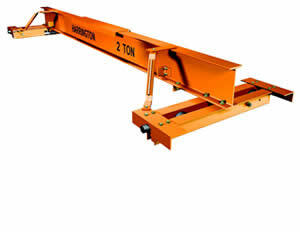 Higher capacities are available with the use of a double girder crane. Spans of these types of overhead traveling cranes are generally limited to 50 ft.
Hand chain driven manual bridges are operated by pulling a chain that is looped over a chain wheel to turn the drive shaft and the drive gears on the bridges wheels. Due to the relatively slow nature of a manual chain hoist, they are recommended for use in applications that require precision spotting. As the loads increase in size and weight, hand chain bridge cranes are preferred over manual push/pull cranes. The heavier the load, the more force it takes to move it. Another advantage of the hand geared overhead traveling crane is that it can be operated at a safe distance form the load. Manual bridges work well with chain fall hoists, electric hoists, air hoists and air balancers. Each crane can be equipped with an electrical festoon wire or an air hose to provide power to your desired lifting apparatus. 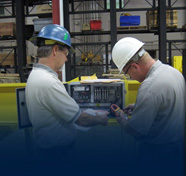 CraneWerks specializes in building overhead bridge cranes and structures. For more information on runway structures go to one of the following pages: Free Standing Workstation Runway, Free Standing Header Braced Systems, Free Standing Knee Braced Systems, or Semi Free Standing Runways. Contact us today for more information or to request a quote on either a bridge crane only, or a complete overhead traveling crane with runway system. Feel free to call any time at 888-544-2121 or email sales@cranewerks.com.